The Clinton County Historical Society is sharing this image with Express readers. It shows a framed series of photos taken on Sept. 5, 1918 — exactly a century ago — of a historic flight that brought pilots Max Miller and Mr. Gardner to Lock Haven. About the time of the First World War, it was determined that airplanes could be used to deliver mail over long distances. The first air mail route ran from New York City to Washington, D.C. and back. Those runs were successful and an east-west route was opened. 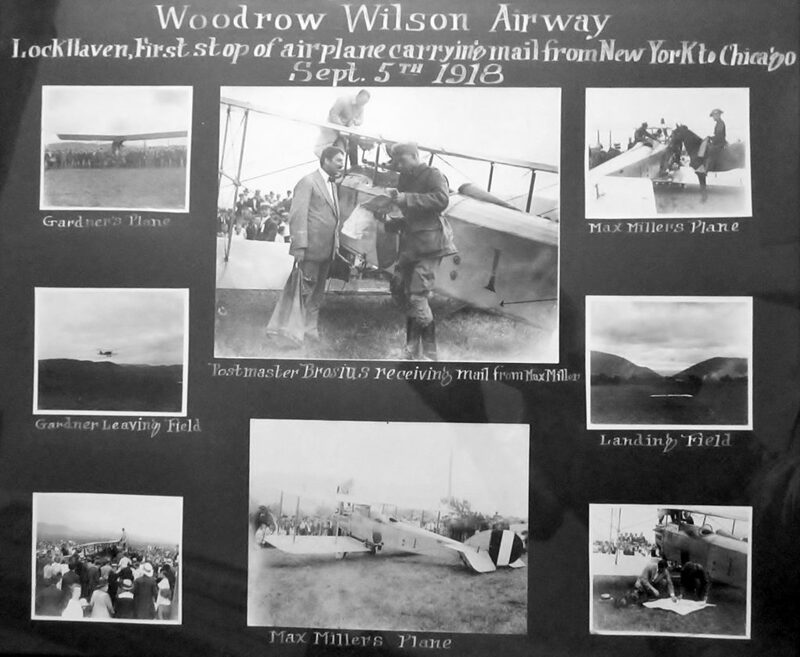 On May 5, 1918, the Woodrow Wilson Airway was established to fly mail between New York City and Chicago. The two pilots pictured landed here on their pathfinder mission to scout a route and to deliver mail. Mr. Brosius, the local postmaster, is seen accepting the mail from Miller in the central photo at top. This framed display is currently on view in the historical society’s Poorman Gallery on West Water Street, Lock Haven.